No matter you are experiencing Hyperlinks not working in Outlook or cannot add a printer to Windows 10, it is a common phenomenon that you receive the warning message saying this operation has been cancelled due to restrictions in effect on this computer. Please contact your system administrator. Why The Operation Has Been Cancelled? When it comes to the reasons why the operation has been canceled error happened to you consist in the permissions set by the administrator of your PC. 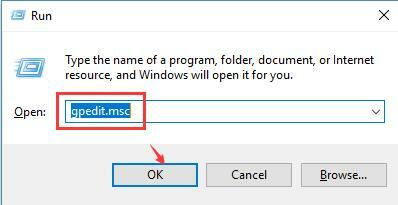 Normally, if the administrator account has made some permissions on Windows 10, when you perform some actions, for instance, add a printer or open the hyperlinks in Firefox, it will prompt you that this operation has been cancelled due to restrictions Chrome, Group Policy and USB Drives. Under no circumstance can you solve due to restriction problem on Windows 10. What to Do with This Operation Has Been Cancelled Due to Restrictions in Effect on This PC Windows 10? The most effective and useful methods for fixing Microsoft Outlook this operation has been cancelled due to restrictions in effect on this PC Windows 10 are to modify the settings in Registry Editor and the Group Policy. As you have been reminded, when this operation has been cancelled error comes to you, another question that your organization policies are preventing us from completing this action for you. That is why now you are suggested to solve the operation has been cancelled due to restrictions on this PC. Get ready to deal with this issue as soon as possible. Here for the sake of convenience and safety, you would better try to change registry editor at first, once the restrictions remain on your PC, move on to fix group policy errors. In Registry Editor, there is a sub-entry named DisallowRun, which is to stop some programs from running on Windows 10. So if links cannot open since this operation has been cancelled due to restrictions in effect on this PC Chrome or Firefox, it is advisable to delete this key so as to remove these restrictions on Windows 10. 1. Press Windows + R to wake up the Run box and then enter regedit in the box. Finally, click OK to get into Registry Editor. 2. 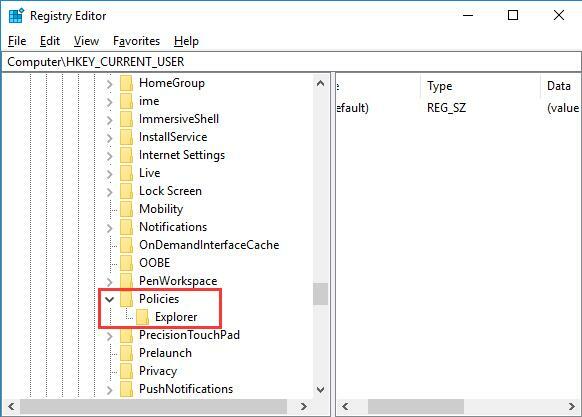 In Registry Editor, go as the path: \HKEY_CURRENT_USER\Software\Microsoft\Windows\CurrentVersion\Policies\Explorer. 3. 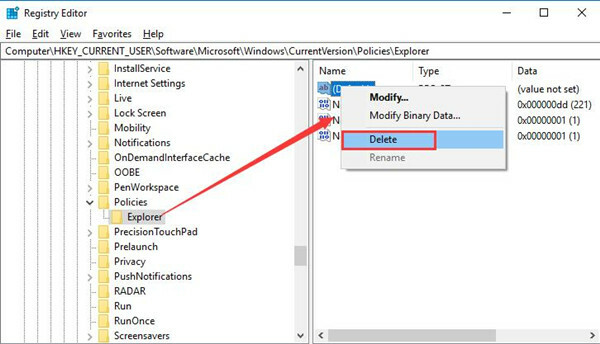 Then under Explorer, on the right pane, right click DisallowRun to Delete it. After you deleted the DisallowRun entry in the registry editor, there will be no more Windows 10 this operation has been cancelled due to restrictions in effect on this PC. 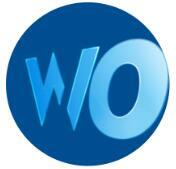 And you are able to open links in Chrome or Firefox. 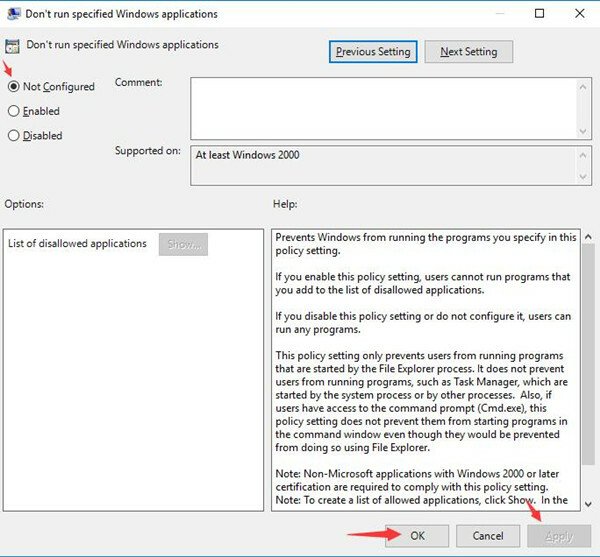 To help you with due to restrictions error on Windows 10, you can also manage to change some of the settings in group policy. It is said that policies in Windows 10 can cause hyperlinks not working in Firefox, which requires you to navigate to group policy and modify it for your PC. 1. In the Run box, input gpedit.msc in the box. And then stroke OK to save changes. 2. 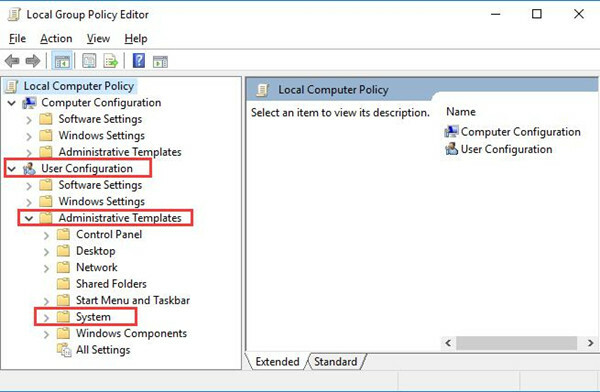 Then you will go to Local Group Policy, navigate to User Configuration > Administrative Templates > System. 3. Under System, on the right pane, find out and double click Don’t run specified Windows applications to modify its Properties. 4. 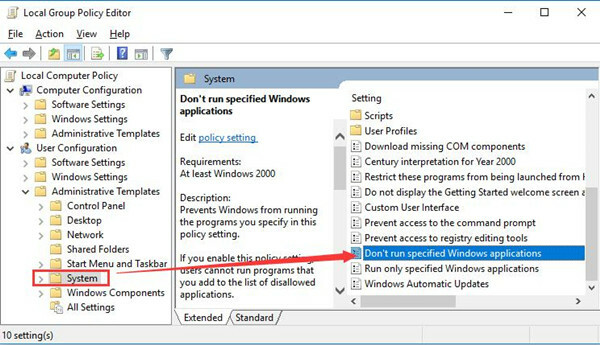 Then in Don’t run specified Windows applications window, tick the option Not Configured. And then hit Apply and OK to save changes. All finished, you may as well manage to attempt to check if this operation has been cancelled due to restrictions in effect on this PC Windows 10 has been resolved on your computer. After that, if you still cannot open links or add a printer to the computer due to the restrictions on Windows 10, maybe you have to restore Windows 10 to a point where the restrictions will not prevent Windows 10 from normal working. To sum up, to fix Windows 10 the operation has been canceled due to restrictions in effect on this PC, it is wise for you to struggle to modify Registry Editor and Group Policy. Hi. Great post, thanks. Actually, I want to block most applications – is it possible to block them silently, without the restrictions message? Or, is it possible to find out which exact application triggered the restrictions message? My OS is Windows 10 Pro. Thanks a lot!